Celestial Buddies new Pluto and Charon plush toys for 2016 make the solar system that much more cuddly. NEW YORK - Build-it-yourself robots, Doctor Who kitchenware, and Star Wars everything—these are just a few of the things we've seen so far at the 2016 New York Toy Fair in Manhattan this weekend. 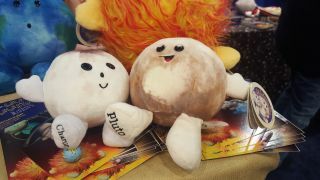 But the undeniably cutest thing we saw (and perhaps one of the cutest things I've ever seen) was the newest plush toy to join the Celestial Buddies line of stuffed planets. The newcomer isn't just one plush, but two: Pluto and Charon. The pairing honors new discoveries about both Pluto and Charon, discovered during the New Horizons flyby last year. While it may not be enough for scientists to give Pluto back its title as our solar system's ninth planet, the double planet status was enough for Celestial Buddies. Pluto and Charon don't just join other planets like Mercury and Mars on the toy maker's shelves, they are also share a special bond. Each of the toys has a magnet sewn between its outer shell and stuffing so when they're near each other they stick together to mimic their natural bond. Nothing in the cosmos tugs at my heart strings quite like Pluto. One moment it's a planet hanging out with eight other planets in the solar system and the next it's stripped of its planet status and demoted to dwarf planet, all because it was a little too small. When New Horizons flew by Pluto, it did more than just give the dwarf planet back some of its dignity, it actually may have given it back its planet status. Thanks to data provided by the spacecraft, scientists proved what they've thought for decades: that Pluto and its largest moon Charon are actually a double planet. Because they are almost the same size and orbit a common center of mass, Charon and Pluto as a pair could be considered a planet, though not all scientists agree. Pluto was discovered in 1930 by astronomer Clyde Tombaugh, and was demoted to dwarf planet status in 2006. Charon, meanwhile, was discovered in 1978, with four more moons - Nix, Hydra, Styx and Kerberos - to follow later. The Pluto/Charon pair are available now at Celestial Buddies for $27.99.